This tasty quinoa bowl with spicy roasted pumpkin is gently spiced by ginger, turmeric, and red chili flakes. It is easy, nutritious and delicious; and makes a hearty & filling gluten-free vegan meal! I'm still all about pumpkin right now. I think we all agree that pumpkin is absolutely amazing in autumn desserts, but my goodness is it delicious when simply roasted with a few spices! I created this when I was in need of something super nutritious. 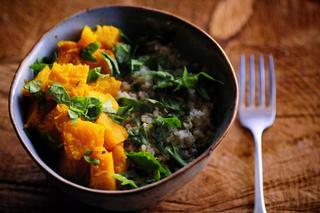 We had a sugar pumpkin sitting around and I thought what better pairing than protein-rich quinoa? This method of roasting results in a super tasty melt-in-your-mouth version of pumpkin. You'll have trouble not eating it as soon as you remove it from the oven! But if you can wait for the delicately spiced quinoa to cook, you'll be more than happy with this delightful pairing! This delicious spicy roasted pumpkin bowl is high in vitamins A, C, E, B6, and fiber, protein, magnesium & iron. There is no doubt that it is good for you, but it is also ridiculously-tasty-good, too! Preheat oven to 400°F.Cut pumpkin in half, scoop out the seeds (set aside seeds to roast later), and then slice pumpkin into wedges.In a small bowl combine oil, vinegar, sugar, ginger, turmeric and salt. Whisk well.Place your pumpkin wedges onto a greased or parchment paper lined cookie sheet.Drizzle wedges with 1/4 cup of dressing. Reserve the rest for later.Roast pumpkin wedges for 30 minutes or until the edges are beginning to brown and the pumpkin is fork-tender.Remove pumpkin from the oven and let cool while you prepare the quinoa.In a medium saucepan on high heat add quinoa and spices. Let toast for 1-2 minutes.Pour in 2 cups of water, bring to a boil, cover, reduce to simmer for 15 minutes, (or according to package directions). When all water is absorbed, turn off heat and let sit covered while your prepare your roasted pumpkin.When your pumpkin wedges are cool enough to handle, gently peel off the skin, and chop roasted pumpkin into cubes for your quinoa bowl.In a small bowl whisk together sriracha and coconut oil. Set aside.When ready to serve, to a bowl add a healthy portion of quinoa, top with roasted pumpkin cubes, sprinkle with greens, and drizzle with your sriracha sauce.Enjoy!